‘Indigo Spires’ is a good all rounder, extremely long flowering in indigo blue, evergreen and hardy to frost and drought. This useful plant was brought into Australia about 1987 unfortunately under the name of ‘regia’, by Marilyn O’Dowd who had a nursery near Campbelltown, NSW, at that time. Thankfully it got sorted out fairly quickly and is nationally known as ‘Indigo Spires’. It originated at Huntington Gardens in Los Angeles and was a deliberate cross I understand, between farinacea and longispicata. Farinacea is the wonderful plant sold in punnets as ‘blue salvia’. It can be good value for two years in a moderate climate, might burn out quicker in hot climates. It has been sold since the days when no one cared what the specie was so no one has bothered to update it. 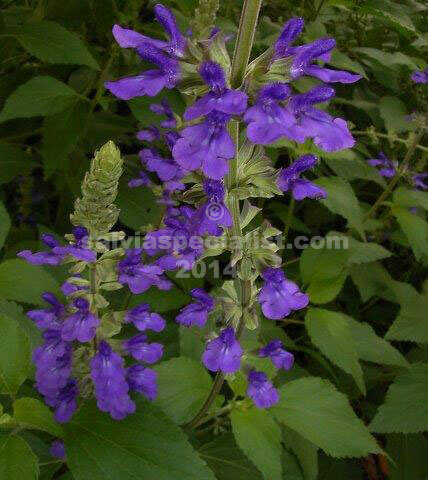 ‘Indigo Spires’ is a very hardy plant blooming for about 8 months of the year. Its name is descriptive. My plant growing in part shade didn’t layer or move about much until we had good rainy years and then it has become rather a large plant (in 30 years!!!) over an area of 2m. It can be encouraged to be tall – 2m – if you contain it in reinforcing wire or some sort of support, otherwise 1m is a fairly average height. Around 2003 a hybrid supposedly with the same parentage, ‘Mystic Spires’ was brought into Australia. This looks identical to ‘Indigo Spires’ but should not grow as large in time. It is more compact but you would have to be fairly expert to see it. A mass of ‘Anthony Parker’ blooming in autumn has the same indigo spikes and could be mistaken by someone not so experienced in salvia. ‘Anthony Parker’ is a much larger plant all round. I put on my labels to cut one stem right to the bottom every 3 months or so and if you had time to do this it would refresh the plant. Otherwise I don’t think you would easily kill it no matter how you pruned an established plant.